A glimpse of Willamette Falls from one of the first viewpoints on the tour. 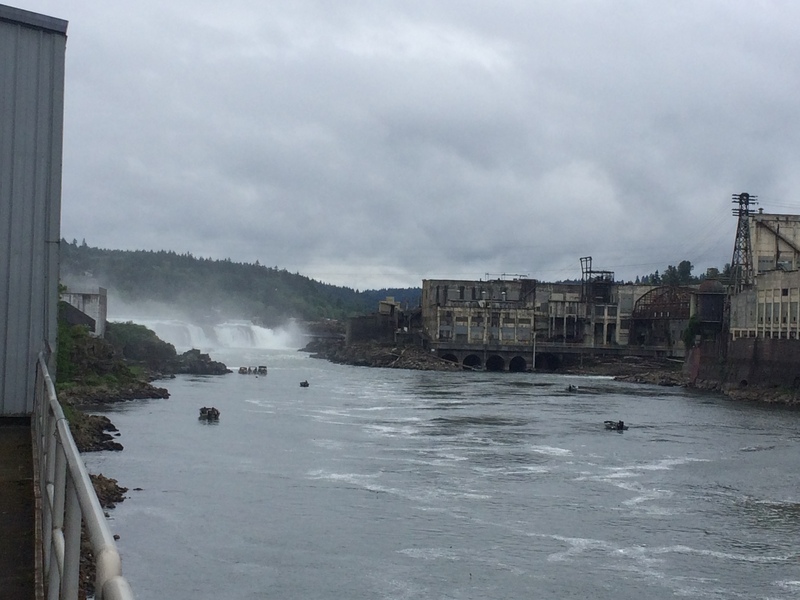 On Saturday, May 21, Willamette Falls Legacy Project staff and volunteers welcomed dozens of people from across the Portland metro region who were quick enough to claim a spot in one of the public site tours. Participants were escorted on a walk through significant site features, starting behind the gate on historic Main Street, including stops at a platform atop the pipechase offering panoramic views up and down the Willamette River; the woolen mill foundation; the Horton sphere (a brick-lined metal vessel that at one time contained sulfuric acid used in the paper-making process); and culminating in the main attraction: walking across the PGE dam to a close-in falls viewpoint where all five senses are immersed in the breathtaking power and beauty of the falls. Oregon City Senior Planner Christina Robertson-Gardiner briefing her group on Main Street at the start of the 10:30 a.m. tour. The 10:30 a.m. tour standing in front of the Horton sphere. Willamette Falls Legacy Project interim project manager Kelly Reid (right) and tour participant Terry Wright, who worked at the mill from 1973 until it closed in 2011. He now teaches welding at Clackamas Community College. They are standing next to Mill E, where Mr. Wright began his career at the mill. Reactions from people upon reaching the falls viewpoint ranged from meditative silence to exclamations of wonder to giddy cheers and laughter. As in the past, these very popular tours were filled in a matter of hours on the first day of registration. We will be sending an email later this summer with instructions to register for the next round of public site tours, so if you aren't on our mailing list, sign up now at the bottom of the page!